There's been plenty of talk in recent times about the growing popularity of cans in craft beer. I've discussed the topic several times here. 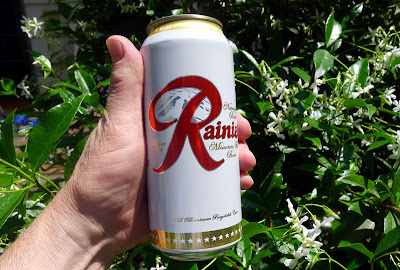 I was mostly concerned with the viability of cans as an alternative to glass. I continue to believe cans are a great packaging option for craft beer and that they will continue to gain share over the next few years. When I wrote those prior posts, I was looking only at the growth factors. The numbers are pretty dramatic, showing off-the-hook increases. The graphs below show what's been happening and which segments are growing fastest, among other things. In case you're wondering, all of these graphs are based on information from the Brewers Association. 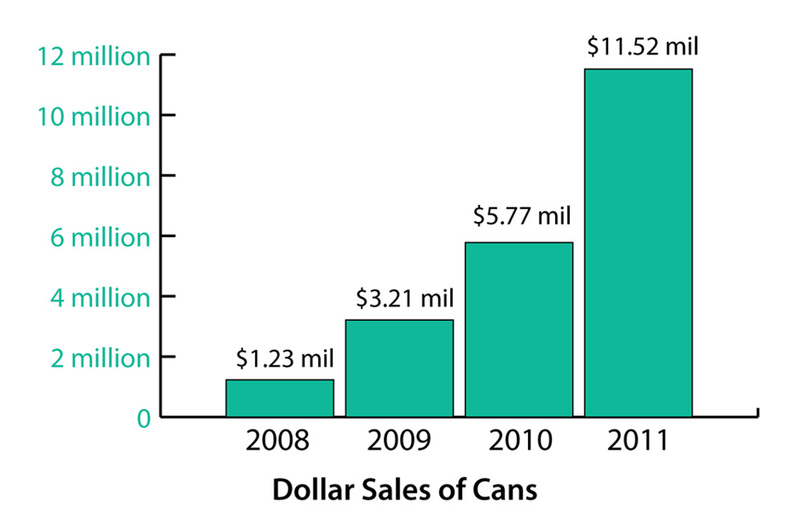 The two graphs below illustrate the growth of canned craft beer in two ways. 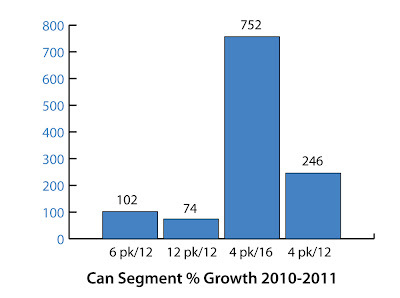 First, you're looking at case sales growth. Next you're looking at the stripped down financials. These are fairly scary numbers. We are seeing a near doubling of numbers each year. 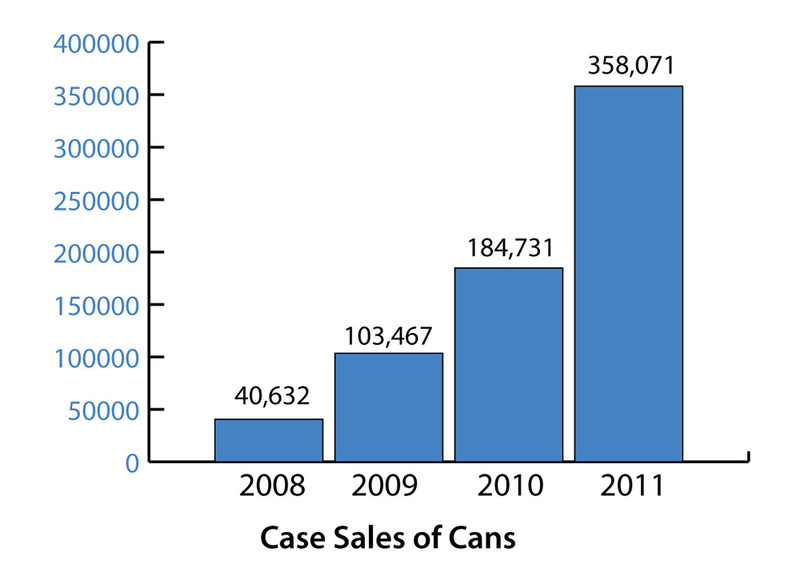 I suspect these figures are convincing some brewers that moving to cans is a viable option. The graphic immediately below shows which packaging types are dominant. The bulk of the market is clearly owned by 12 oz cans, whether in packs of six or 12. I'm trying to recall seeing 12-packs of craft cans. I see lots of 6-packs, as well as 4-packs. But not so many half racks in cans. Oh well. The next graphic shows where the growth is. The two segments with the smallest share of the can market turned in by far the greatest growth for 2011. The growing popularity of 16 oz cans is handily illustrated here. 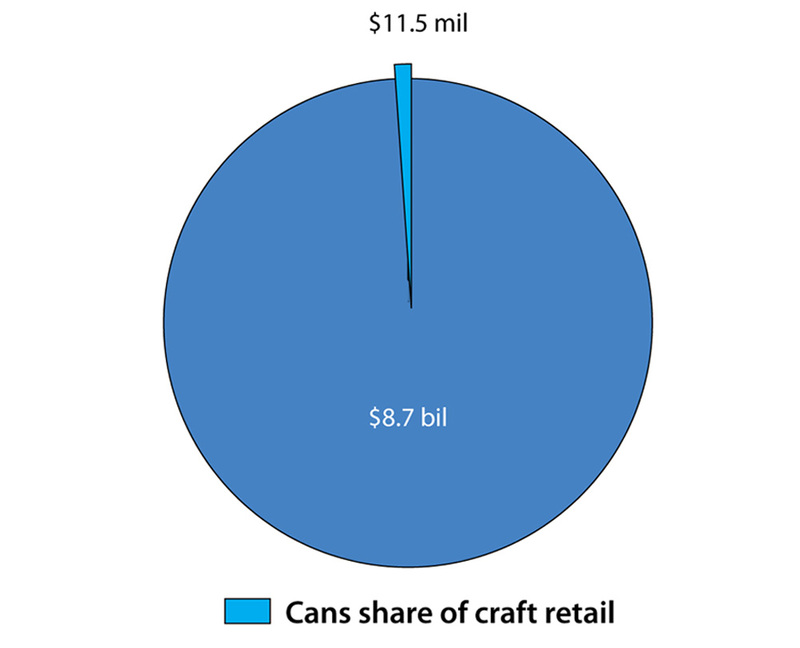 These numbers suggest that some craft brewers may see 16 oz cans as an alternative to 22 oz bottles. I can't run too far with that, but that's what I suspect. Meanwhile, 12 oz cans are competing with 12 oz bottles...which dominate the retail category. Understanding the place that cans have in craft beer means you have to know the size of the market. The Brewers Association says the retail craft beer market was worth $8.7 billion in 2011...representing a 15 percent increase over 2010. Rapid growth continues...you gotta love that. Now for the shocking part...if you think cans are about to take over craft beer distribution. 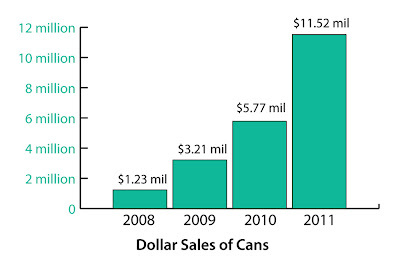 The graph below shows what share of the $8.7 billion market is owned by cans. The number is $11.5 million. In other words, barely a blip. Despite monstrous recent growth, which tends to warp perceptions, cans have a very long way to go before they become a serious player in the overall scheme of things. 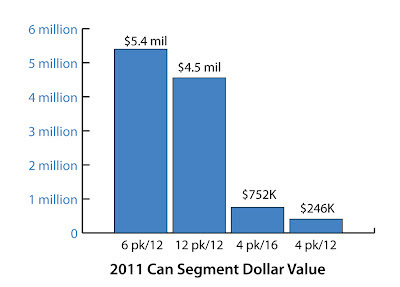 Just for fun, consider comparative numbers for 22 oz bottles: They own $44 million of the craft retail market. Bomber market share increased by 35 percent in 2011 and they remain a popular option for breweries and buyers. Yet 22 oz bottles account for only about 5 percent of overall retail sales. And cans represent about a fourth of bomber volume. Yikes! Note: This post was updated on 9/21/2012 to correct a mistaken data point.